In 1969, the Cuyahoga River in Ohio caught fire. Apparently this wasn't an entirely uncommon occurrence on the highly polluted waterway, as river fires had been reported there as far back as 1868. But the one that happened about a century later caught the interest of Time magazine, who described the lowly Cuyahoga as a river that "oozes rather than flows". A few years later, the Clean Water Act was passed and everyone lived happily ever after. Oh, and Great Lakes Brewing Company made this beer in honor of the Cuyahoga, the river that burns! Beer Nerd Details: 6% ABV bottled (12 oz.) Drank out of a tulip glass on 6/22/12. 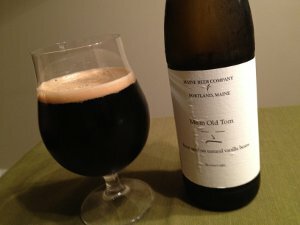 I've already mentioned my Pavlovian response to fancy packaging (boxed bottles, fancy labels, wax dipped caps, etc...), but I also have to admit that there's something to the minimalism of Maine Beer Company's label designs. Simple fonts, straightforward description of the beer, maybe a little representative pictogram, but their labels are clearly dominated by whitespace. Sometimes straightforward trumps fancy, and you have to admit, Maine's simple bottles do stand out on a shelf. 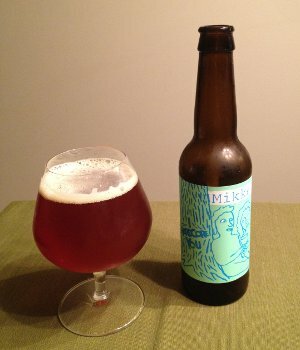 Beer Nerd Details: 6.5% ABV bottled (500 ml). Drank out of a tulip glass on 6/15/12. Bottle sez 050312 (presumably bottling date) and 6 (batch number?). 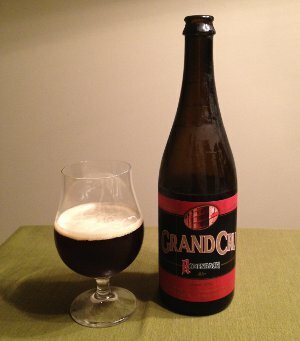 Beer Nerd Details: 9.5% ABV bottled (11.2 oz) Drank out of a snifter on 6/15/12. Great, now I want to go and revisit the component beers again. But I'm guessing that won't happen anytime soon. I'm pretty stocked up at the moment, though I do have a couple Mikkeller beers in the pipeline. Though if I remain a month behind on reviews, you probably won't see anything for a couple months. I may have to do a quick catchup post at some point, but I guess we'll see. It's not exactly a secret that I love me some bourbon barrel aged beers, so it will come as no surprise that I really enjoyed this offering from Michigan's New Holland Brewery. Maybe I've got a problem, but there's just something magical that happens when you put beer into a bourbon barrel for aging. I just love the added richness of flavor, complexity, and thick, chewy mouthfeel that comes with the territory. Dragon's Milk is aged in old Heaven Hill Bourbon Barrels for at least 90 days. As previously discussed, this is partially due to the fact that the legal definition of Bourbon says that the whiskey must be aged on new oak, leading to a big secondary market of used oak barrels that brewers can latch onto. But apparently New Holland can only use those secondary Bourbon barrels once to age beer. "Second-use barrels don't give the beer the same character," says New Holland's Brett VanderKamp. But this is where things get really intriguing. New Holland also runs a small, artisanal spirits business, and they've started to use their old Dragon's Milk barrels to age their whiskey... Consider my mind blown. What a great idea. When I was in line for Dark Wednesday, some beer nerds and I discussed the possibilities of this very thing (aging whiskey in beer barrels). I didn't think it would happen so soon, but it's a welcome development. This is apparently still in the prototyping phase, though both Jim and Don from the Beer and Whisky Brothers managed to get a hold of some of the stuff. The verdict: everyone seems to love it. It seems something magical happens when you put whiskey in a beer barrel for aging. I absolutely need to get my hands on some of this stuff. Beer Nerd Details: 10% ABV bottled (12 oz). Drank out of a snifter on 6/1/12. I have no idea if and when this beer barrel bourbon will be available, but if I get a chance to try some, I'll be sure to let you know. In any case, my consumption of barrel aged beers will probably continue to be unhealthily high. Summer seems a little less barrel-agey, but don't worry, I'm sure I'll be hitting up plenty of interesting stuff in the coming weeks. 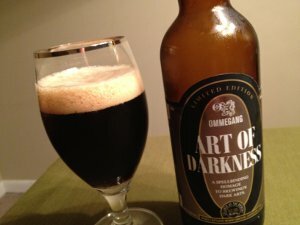 Beer Nerd Details: 8.9% ABV bottled (750 ml caged and corked). Drank out of a goblet on 6/9/12. Bottled on 02/27/12. Best by 02/2015. So where does this fit in? I'd say, towards the top of Ommegang's limited edition brews, if not quite the pinnacle. Quite enjoyable though, and well worth a try. Up next from Ommegang, a rather old limited edition brew I've been squirreling away in the basement for, sheesh, has it been two years? We'll see. And I've been seeing this Biere D'Hougoumont all over the place too, and I'm betting I'll get me a bottle of the stuff at some point. * As recently established, it only takes two examples to constitute a "rash" of something. Every once in a while I think to myself: Self, you should try more German beer. They've got a long, illustrious brewing tradition and you've only tried but a few beers made there. 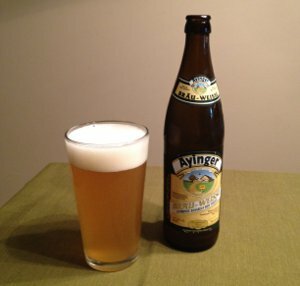 I then drink one, such as Ayinger's well-respected hefeweizen, and promptly forget to buy/drink any others. While usually well-crafted and tasty, I'm rarely all that intrigued with German beers. But who am I kidding, I probably just saw some fancily packaged, limited batch, barrel-aged behemoth and my carefully curated Pavlovian response kicks in, making me blind to the likes of German beer. But I digress. The point here is actually that I don't always drink massive face-melting American beer, and I must admit that this one really hit the spot after Philly Beer Week (where I probably overdid it with the drinkin). Beer Nerd Details: 5.1% ABV bottled (500 ml capped). Drank out of a shaker pint on 6/8/12. Well, I don't have any other German beers in the pipeline, but I'm sure I'll have another hefe or two this summer, as they really do hit the spot on a hot day. In the meantime, I'll have to make do with all these face melters I bought recently. It's a hard life. Back when my beer nerdery was going into overdrive (let's say 2009ish), I saw a few bottles of this at the store and balked at the high price tag ($8 for a 12 ounce bottle). Little did I know that I wouldn't even see another bottle of the stuff for two years (this delay was apparently exacerbated by a bad batch that had to be dumped, as portrayed on the short-lived Brewmasters tv show). So when Dogfish Head started releasing the new batch last year, I jumped on the opportunity. I had some on tap and picked up a few bottles, price tag be damned*! 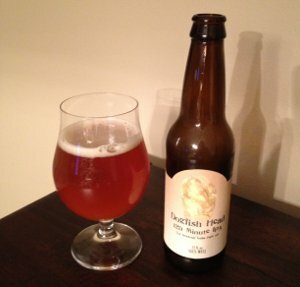 I don't always love Dogfish Head's wacky shenanigans, but I usually find their stuff interesting and worth a shot. And say what you will about their shameless gimmickry, but Dogfish Head knows what it's doing when it comes to IPAs, and their "minute" series is a sorta rite of passage amongst hopheads around here. I've already talked about the history of the massive 120 Minute IPA, but one thing I never quite understood was the beer nerds' dismissal of this beer when it's still "young", claiming that it's "undrinkable" unless it's been aging for at least two years. When I had it on tap, I had no idea what these dorks were talking about, but now that I've cracked one of my bottles, I may have an idea what they mean (even if "undrinkable" is an overstatement). Beer Nerd Details: 18% ABV bottled (12 oz.) Drank out of a snifter on 6/2/12. 2011 vintage. 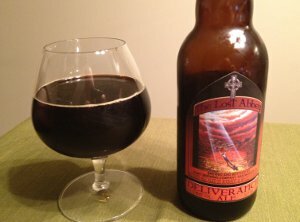 How is it possible that I've only had (and reviewed) two Lost Abbey beers since starting this blog? I'm really at a loss to explain this. I love me some Belgian style beers, and there are only a few American breweries that really specialize in that realm, so I'm not sure about the cause of my neglect. It's not like the stuff isn't readily available in my area, so I figure I should rectify this situation before the beer dork police knock down my door and confiscate my beer. And this looks to be a spectacular start - a blend of two other beers: bourbon barrel-aged Serpent's Stout and brandy barrel-aged Angels Share (I've had the bourbon barrel-aged Angel's Share on tap before, and loved it, even if I thought it was a bit hot). Beer Nerd Details: 12.5% ABV bottled (375 ml caged and corked). Drank out of a snifter on 5/27/12. 2011 vintage. I actually have a bottle of the bourbon barrel-aged Angel's Share in the cellar. Given that I found it a bit "hot" on the first go around, I thought I'd give it some more time in the cellar. In the meantime, I certainly have a lot of other Lost Abbey beers to get through, so while I don't currently have any in the pipeline, I'll almost certainly be hitting some up this summer. The way I see it is that I love beer and pubs and I don't see why I should only go to the pub when I'm with other people. How do you feel about going to the pub alone? Do you feel it's necessary to be around friends to spend time in a pub? No, fine, and no, respectively. As Nate mentions earlier in his post, there is a stigma attached to drinking alone that ultimately boils down to concerns about alcoholism. And those are valid concerns. I realized a while ago that the majority of my drinking is done alone. It's not that I don't drink with other people, I certainly do, but my most interesting drinking happens when I'm home alone. For a number of reasons, I try to keep my drinking in check. I don't usually drink to get drunk. It's fine to do so on occasion, but my obsession with beer (and scotch/bourbon) is less about drunkenness and more about flavor. There is a hedonistic aspect to all this which is troublesome. Sometimes I wonder if I'll end up solving puzzle boxes and playing with Cenobites, but for the most part, I've got things under control. I generally only drink on weekends, with the occasional happy hour (or beer club meeting) for fun... but that's with other people. I digress. This session is about going to the pub alone. I do this too, but not super often. There are a few reasons I'd end up at a pub by myself (Beerbecue has some other reasons too, all of which are excellent). One is that the pub will have some hard-to-find beer I've been trying to track down. Stuff like Pliny or Hopslam or anything by Hill Farmstead. This does not preclude going to the pub with friends, and sometimes the stars align and that happens, but my friends are not as obsessed with beer as I am, so I sometimes go it alone. Another reason I like to go to the pub alone is that most places with a great beer selection also have great food, and you know, I like good food. Again, none of this precludes going with friends, but these visits are often extemporaneous and unplanned, so if no one's around, I end up at the pub alone, with a good meal and fantastic beer. Ain't nothing wrong with that. Finally, I usually find that I'm not alone at the pub. I'd say that about 90% of the time I go to the pub alone, I end up having some interesting conversations with other patrons (with 9% being uninteresting or frustrating conversations and 1% being no discussion at all). It turns out that beer dorks are friendly, outgoing folk. I'm a massive introvert and I live in an area where striking up conversations with strangers is... unusual. But it happens in good beer bars, and for the most part, it's a welcome development. Again, none of this is to say that going it alone is preferable (or not, for that matter), but I also don't think there's anything wrong with it. I like that I do both from time to time, but honestly, I don't think it would matter all that much if I did one or the other exclusively. In the end, I like beer and I like pubs, which is all that really matters. Alone, with friend, with strangers, whatever. There are pros and cons to everything, and anything in moderation can be a good thing. That being said, I can't wait for my next visit to Teresa's, or the Station Taproom, or the Side Bar, or Iron Hill, or even Victory. Come join me! Or not! It doesn't matter!